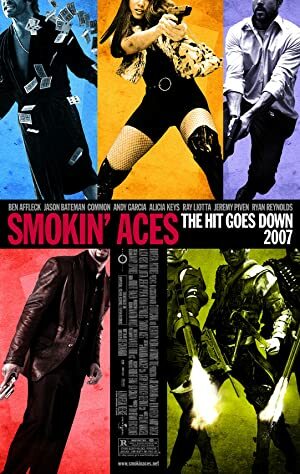 Smokin’ Aces (2006) – What's New on Netflix Canada Today! Mob boss Primo Sparazza has taken out a hefty contract on Buddy “Aces” Israel, a sleazy magician who has agreed to turn state’s evidence against the Vegas mob. The FBI, sensing a chance to use this small-time con to bring down big-target Sparazza, places Aces into protective custody-under the supervision of two agents dispatched to Aces’ Lake Tahoe hideout. When the word of the price on Aces’ head spreads into the community of ex-cons and cons-to-be, it entices bounty hunters, thugs-for-hire, deadly vixens and double-crossing mobsters to join in the hunt. With all eyes on Tahoe, this rogues’ gallery collides in a comic race to hit the jackpot and rub out Aces.